Epitomising the Southern California lifestyle, the beaches and seaside suburbs are the heart and soul of the city, with bikini-clad bodies, sun-tanned surfers, and a plethora of little shops, coffee houses, cafes, and restaurants. The 70 miles (113km) of sandy coastline attracts swimmers, sunbathers, surfers, volleyball players and snorkellers. A boardwalk that runs from Mission Beach to Pacific Beach is extremely popular for rollerblading, jogging and cycling. Mission Bay is a playground for waterskiing, sailing and windsurfing, and the surrounding beaches of Mission Beach, Ocean Beach and Pacific Beach are known for their wide stretches of sand as well as for the vibrant nightlife and dining. The northern part of Ocean Beach is known as 'Dog Beach', one of only two beaches in San Diego that allow dogs. 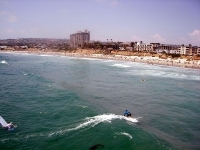 Mission Beach is the most popular with plenty of action, particularly along the Ocean Front Walk that resembles the boardwalk parade of Los Angeles' Venice Beach. To the north, the pretentious seaside suburb of La Jolla is known for its high-priced real estate, expensive shops and excellent restaurants, as well as its beautiful coastline with lovely coves, cliffs, gorgeous beaches and superb surfing. La Jolla Cove has clear waters and the offshore San Diego-La Jolla Underwater Park affords brilliant snorkelling and diving, with giant kelp forests and a deep canyon.